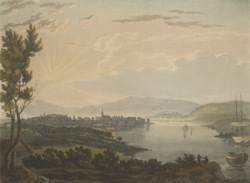 View of Waterford in South Eastern Ireland. Waterford is the oldest city in Ireland, and was founded in the 8th century by the Vikings. They saw the strategic and trading importance of the three rivers which empty into Waterford Harbour and built a longphort or dock at the confluence of the St. John's River and the River Suir. The settlement was named it Vadrafjprd which translates as ‘Weather Fjord’; this might refer to the fact that the harbour they developed was a safe place of refuge from the prevailing winds. The city was later expanded by the Anglo Normans and it became Ireland’s most powerful city.